So, the month of April 2018 is arrived, and a lot of magazines filled the market with the latest issue of the same. If you love to read knowledge oriented magazines with a substance, your choices would be limited though. Safari is one of the few magazines which publishes knowledge and science oriented articles and thus we are eagerly awaiting for it every month. The issue of this month is arrived a couple of days late in the local market due to the circumstances, but, it is definitely worth the wait. On a side note, the English edition of Safari couldn’t survive long and only the Gujarati edition is available. It is sad. It makes the reach of the quality content of the magazine restricted to Gujarati knowing readers only. Suchmagazines needs to be survived and reached to the maximum readers. Another such magazine is sudharma, which we have talked about it in past also. Sudharma (सुधर्मा) is the only daily newspaper published in the most ancient and feature rich language which is survived, but the magazine cannot survive for long and the reader base for the same is shrinking. Sudharma is published since 1970, just FYI. Can we do something to save Sudharma? Let us take a look at the cover page of April 2018 issue of Safari magazine. The cover page is rich with many illustrations and article titles. Of course, it is expected to see Stephen Hawking’s carry-catcher on the cover page, as we lost the great scientist recently. The article is written in the different context though. The illustration of British rulers brutally torturing (then) dependent Indians will make you sad and angry at the same time. It represents an article about the freedom struggle of 1857 and what happened afterwards. Overall an interesting and attractive cover page which passes with full marks :). We consider the editorial as one of the most important part of any magazine or for that matter any media, as it gives a chance to the editor of the magazine to connect with the readers directly. He can share his vision about the content explored in the issue and his thoughts about the surroundings and happenings. In the editorial of this month Harshal Pushkarna, the editor of the magazine, talks about “privacy and social media”. Of course, we cannot reveal his thoughts here, but suggest you to read it once. It is small and more importantly “required” reading. We, at ThinkerViews, often said that you need to be careful when using social media and the life is not all about showing and exposing it to the others, but rather, it is to live. This article is printed on the back covers of the issue and talks about BrahmaGupta, the legendary mathematician who considered himself an astrologer (more than the mathematician). He is the one who invented Zero. Do you know that in the final verse of “What is it? It’s nothing”, Johnny Ball, referred him as “This unknown chap became hero, the day he invented zero”? A small yet well researched article by Sushil Bhatiya is worth reading. It doesn’t only exposes the ignorance of people from the west, but also the people from his homeland. It is not only the social media, but, the world of technology became a part of our lives in other aspects as well. We are living in the world where electronic records hold most of the information. And, thus they are prone to be stolen and misused. The solution thought to secure them against it, is password. Eventually, we became aware that they can be cracked. So, there came the stronger passwords and encryption to make them fool-proof. But, as we know, when you secure the things with stronger locks, the thieves can go ahead and find even smarter solutions. So, there came a situation when the experts have decided to go with bio-metrics. As we all possess unique fingerprints and cornea impressions, using them to secure our valuables could be more secure. Does it? A well, researched article in this magazine issue in this context is worth reading. The article is nicely written and it covers many things including the recent hacking and cracking incidents (which affected a majority of Internet users). The article also explains the biometrics system(s) in detail. If you don’t know anything about fingerprint scanning for example, then also go through this article and you will get to know all about it. In today’s Information Technology age, you need to know all about such advanced systems which are eventually becoming the part of our lives, and the way it is represented in this issue of safari, I hadn’t read it in as simple and detailed manner, better than this. India, that is Bharat, got its independence from British rulers in 1947, but it was a result of many recognized and unrecognized battles by the freedom figters of the country. The freedom movement of 1857 was one of the most remarkable because of its vast canvas. It shook almost entire nation, and it was the first strongest message to the invaders to go back. Unfortunately, the movement was overpowered and it didn’t brought the results expected. Much is written about the freedom struggle of 1857, but a very less is written about the brutal aftershocks the rulers gave to the Indians. No ruler can ignore such a large movement which is nothing less than a revolution. But, rather than trying to calm the people down by being more friendly to them, the rulers have decided to show their might in barbaric manner. 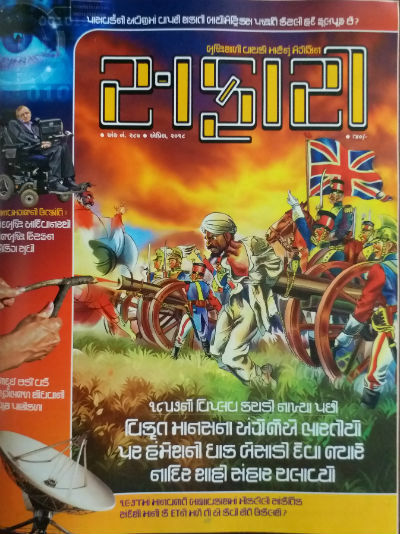 Rather than spreading hatred about what happened in the past, with a vision to know the truth and real history, a detailed article on this the freedom struggle of 1857 and its aftermath is written in this issue of Safari. A highly recommended read. We, the human beings, became the strongest in survival species because of our brain, and there are no two thoughts on that. Now many of us consider that the evolution of our brain lead to various discoveries and we became the species who once were living in caves and don’t know how to use a stone for our own benefit, to the species who can reach to the mars. That is correct, but does the development of brain lead to the discovery of art of cooking or the art of cooking is responsible for the development of brain? An interesting article written in the context of human evolution where the body was considered as the strongest and the only way to exists, to the time, where one person who lived his life almost in a wheelchair and hardly able to do physical movement is considered as of the most knowledgeable scientists! Yes, we are talking about Stephen Hawking. There are many other regular articles and sections which you will find worth to go for. The articles in this magazines are repositories of knowledge in the specific segments and they all are embedded with pictures, graphics and illustrations to make it easy to understand. A good knowledge is meaningless if one cannot digest it, right? All the articles are written in such an interesting manner that you can digest it easily. Such simplification of the information is quite rare to find. Overall a nice magazine issue with a substance. You must read it. It is definitely worth the money and time you spend to read it.